A Providence mill built in 1832 has received federal recognition for its contributions to the history of industry. Edward F. Sanderson, Executive Director of the Rhode Island Historical Preservation & Heritage Commission, announced that the National Park Service has added the Heaton & Cowing Mill to the National Register of Historic Places. The National Register is the Federal Government’s official list of properties throughout the United States whose historical and architectural significance makes them worthy of preservation. Built for the manufacture of textiles, the Heaton & Cowing Mill is a rare representative of the small-scale textile factories that utilized the water power of Rhode Island’s smaller rivers and streams in the first half of the 19th century. 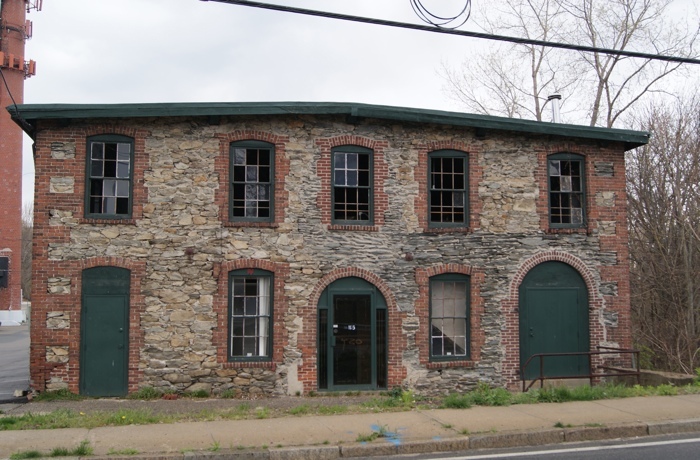 Located at 1115 Douglas Avenue in Providence near the North Providence line, the Heaton & Cowing Mill is a small, two-story factory built in 1832 with an addition built between 1926 and 1937. The primary block is a coursed rubblestone masonry structure with a shallow end-gable roof. The brick trim—quoins and rusticated window and door surrounds—probably date to a rebuilding project following a fire in 1861. The original building has a generally open plan with timber framing, typical of mid-19th century mill construction. In 1832 David Heaton (1802-1864) and Martin K. Cowing (1807-1891) purchased a mill privilege on the West River in what was then part of North Providence. Although the waterpower of the West River was limited, the site was sufficient for a small manufacturing operation and convenient to transportation routes such as the Douglas Turnpike (laid out in 1807) and the Mineral Spring Turnpike (1826). The two partners immediately erected a small mill and began to manufacture cotton cloth under the name of Heaton & Cowing. Heaton & Cowing leased space in their mill to other textile companies, including a “coloring, bleaching, and staining works” and a woolen manufacturer and finisher. The firm continued to improve and adapt their water privilege on the West River. They invested in a water company that impounded the West River to create the Wenscott Reservoir, allowing them to store water that supplemented the run of the river during low-water months. In 1853, Heaton & Cowing installed a new raceway to tap the West River upstream at a higher elevation and thus to age 2 of 2 increase the amount of power they generated. In 1860, Heaton & Cowing’s 8 male and 21 female workers produced 150,000 yards of braid valued at $25,000. In 1862 Heaton & Cowing invested in the construction of the Geneva Mill, a substantial brick industrial plant, comprising a main building with an attached repair shop, dye house, and finishing rooms. The Geneva Mill used waterpower and steam power, while Heaton & Cowing reverted to drawing water from the original river channel and created a new mill pond, later known as Geneva Pond. Heaton & Cowing leased the new mill to various operators for sixteen years and then sold the entire property to the firm of Ullman and Sack (later Geneva Worsted Mills). After a major fire in 1891, the Geneva Mill was rebuilt acquiring much of its present form. By 1891 textile manufacturing had ceased in the ca.1832 mill, which was reused for storage and a carpenter’s shop. In 1896, the Wanskuck Company, a manufacturer of worsted fabrics, acquired the entire Geneva complex. Over the years, the new owner made a number of improvements to the plant, demolishing some obsolete structures and building the large brick, two-story addition to the old mill between 1926 and 1937. Labor conflict and southern competition forced the Wanskuck Company to close down the plant in 1957. No longer associated with the neighboring Geneva complex, the Heaton & Cowing Mill served various industrial uses between 1957 and about 2000. These included electroplaters, polishers, and manufacturers of jewelry findings. The mill, its brick addition, and the cement block building have been vacant since that time. The waterpower system at the mill has largely disappeared as the raceways have been filled, and in the floods of spring 2010 the Geneva Dam was breached and the mill pond drained. In addition to honoring a property for its contribution to local, state, or national history, listing on the National Register provides additional benefits. It results in special consideration during the planning of Federal or federally assisted projects and makes properties eligible for Federal tax benefits for historic rehabilitation projects. Owners of private property listed on the National Register are free to maintain, manage, or dispose of their property as they choose. As the state office for historic preservation, the Historical Preservation & Heritage Commission is responsible for reviewing and submitting Rhode Island nominations to the National Register.